1 Heat 2 tablespoons of the oil in a large saucepan over medium-high heat and add the minced ginger, garlic and chili peppers. Stir until golden, about 1 minute. Add the coriander, cumin, garam masala and chili powder. 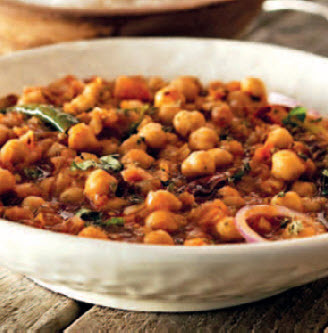 Mix in the cooked chickpeas, salt and water, and cook, stirring as needed until tender and almost dry, about 5 minutes. Reduce the heat to medium, and cook another 5 minutes to blend the ~avors. Transfer to a serving dish and keep warm. 2 Heat the remaining 1 tablespoon of oil in a small saucepan over medium-high heat and add the cumin seeds; they should sizzle upon contact with the hot oil. Quickly add the ginger matchsticks, and then add the onion and tomatoes and cook until golden. Stir about 1 minute and add to the chickpeas. 3 Garnish with the fresh coriander and serve hot.